Last week I shared with you the first ten of the Betta Living summer holiday activities from the Kids in the Kitchen guide - lots of different activities that can be done in your own kitchen for as little as 99p. This week features some of the activities that we have most enjoyed doing, and all for a matter of pounds (and no need to worry about the weather). My Girls LOVE to play with their toy food in their toy kitchen and they have a handy "market stall" / puppet theatre but I had never thought about letting the girls set up their own "shop" using the food from our cupboards. The role play and imagination was great to watch and Lara has started showing signs of understanding money; these days she is also able to read the labels of all of the things she sells in her shop. Great rainy day fun that could last for hours! All you need to make these is a balloon, some ripped up paper and some papier mache glue (that you can make from flour and water, or diluted PVA). Paste the ripped up paper onto the inflated balloon and leave to dry. A few days later, come back and paint and decorate your balloon as a bumble bee, ladybird or any other creature you can think of. Our kitchen is a galley kitchen which makes it rather handy for playing skittles! Who knew? Holly had SO MUCH FUN making homemade ice lollies. All you need is a flavoured juice or, in our case, Angel Delight and milk! Our ice lolly moulds (supplied by Betta Living) cost less than £2.50 from Aldi and you can use the moulds again and again. Making bunting is a great activity for learning shapes and measurement. For older children you can get them to sew the bunting. We cut out paper and card, used a hole punch to make holes to thread through a ribbon and then decorated our triangles with brightly coloured tissue paper as part of our Elmer the elephant parade. Bunting can make an indoor space seem more bright and fun. Place straws in two long lines to create a race track. Each player puts a ping pong ball or cotton wool ball on the track and then has to blow the ball, using a straw, over the finish line. Very silly fun for all of the family. What better way to make the most of your kitchen this summer than to get your kids cooking? My girls love to help in the kitchen. Making your own dough doesn't have to be complicated, in fact there are some great ready-made bread mixes out there that don't even need proving. Making dough is messy and fun! But most fun of all is turning your dough into a pizza afterwards and it is a great way to use up left-overs of lots of different healthy toppings. After all that cooking, let the kids do the washing up! You'll be surprised how much fun washing up can seem to a tiny person who doesn't usually get to do it. Children of all ages love to build towers. Build an edible tower using mini marshmallows and cocktail sticks and see how high you can make it! You can make towers out of all sorts of kitchen equipment such as plastic cups, paper plates and cutlery. I have been collecting toilet rolls, boxes and food trays for a couple of months before the holidays started so that we would have a stash of junk for modelling with. Lara loves making robots, rockets and boats from junk and then painting them after she has built her creation. Little Live Pets are small, interactive toys from Character which are designed to encourage interaction and responsibility in children. Lara was sent a Little Live Pets butterfly a couple of weeks ago and she immediately took up the challenge of making it 'happy'! The Little Live Pets respond to your child's touch and interaction. The more you play with it, the happier it becomes. Lara's butterfly started off with short sharp fluttering movements but after feeding it and playing with it for a few days, the movements became more fluttery and less juttery and it will flap its wings for longer. When Lara first received the Little Live butterfly she was a little wary of it. I think she found it very realistic. The wings of the butterfly are almost paper thin and the movement was unpredictable. Once she understood that it was responding to her and seemed 'happy' to be touched Lara relaxed and enjoyed herself. To make it work, you place the butterfly on the palm of your hand and the sensors trigger the movement. It flaps for around a minute before waning to be fed. To feed it you place it back on the flower which also acts as a charging point. After a period of inactivity it will fall asleep. You can also place it in its own little display mount. I was worried that the novelty of the Little Live Pet would wear off quickly. I had been expecting the interaction with the pet to be a little more of a challenge - something akin to a Tamagotchi. I felt that the Little Live Pets would be suitable for younger children as it really only required two levels of interaction... feed and play. You don't have to time it for particular times of day or make sure that you remember to attend to it, you simply have to give it a little love and attention when you're around. I remain to be convinced about the longevity of Lara's interest in her Little Live Pet but two weeks in, she does still like to come back to it when she gets home in the evening and play and feed it nefore her own meal. Little Live Pets are also available in a bird design; the bird will sing and chirp in response to your touch. Bedtimes for Holly have been a struggle ever since the clocks went forward and so I have had to find some innovative ways of soothing her, especially when it gets to bedtime. Over the past two years I have, on and off, dipped back into the baby massage and I have found that it definitely helps Holly to settle down to sleep. Sometimes Holly fights bedtime so much that I have to try quite hard to start massaging her feet. She wiggles a lot. But, once the magic has worked, she lies more still and lets me continue massaging. These days she is very bossy about "this foot" or "no, this foot" and will even say "my head" if she wants me to massage there too. If you are struggling with bedtimes for your toddler then I recommend giving some of these techniques a try. Don't worry if they don't work miracles to start off with, keep trying and see if they begin to recognise a pattern after a few nights. It isn't a foolproof bedtime ritual but it occasionally helps me and Holly. No massage oil needed! I always start with the feet - it is my message to Holly that it is time to chill out. I stroke the tops of her feet, down from the top of the ankle to the toes about 3 or 4 times. Then I hold each toe in turn and give it a tiny squeeze. If she is in the mood then I will use my forefinger to make tiny circles on the base of her feet while holding her foot with my other hand. You can make tiny circles on the base of the heel too. To finish, clasp the foot in both hands to keep it warm. Then move on to the other foot. One of Holly's favourite pasttimes is to play "round and round the garden" with me, Daddy or her toys. At bedtimes, if she lets me, I make little circles on the palm of her hand with my forefinger, and then circles on the back of her hand with my thumb. I gently pull one finger at a time and give it a little wiggle to try and loosen things up. Rub gently in circles using your thumb and forefinger around the wrist, then gently rock the wrist forwards and backwards. When it is just about time to move on to the next hand, hold the hand firmly between your palms and give it a squeeze before gently lying the arm down to rest. Holly and her older sister both love having their temples massaged at bedtime and it is a guaranteed way to turn my grumpy toddler (above!) into a mellow toddler! I press my forefingers quite firmly on each eyebrow, working out from the centre of the nose to the temples. When you get to the temples, press with two fingers and then give your fingers a little wiggle. I like to stroke upwards from the nose to the forehead ever so gently to help soothe them. Sometimes Holly falls asleep at this point! If your toddler is feeling particularly boisterous at bedtime then try to encourage them to settle by quite firmly running the palms of your hands down the backs of their legs as they squirm around. I have no idea why this works but it often encourages Holly to pay attention. Maybe she knows that it normally means she will get a foot massage too? As with the stroking legs, this technique seems to work best when Holly has been particularly wide awake beforehand. My older daughter still quite regularly requests that I stroke her back if she is struggling to sleep. I encourage them to lie with their back facing me and I run both hands down either side of the spine from the top to the bottom. Nothing more innovative than that, but it soon builds up a rhythm if you do it several times and I think it is this which helps at bedtime. If bedtime is full of smiles then I will occasionally still perform some more traditional baby massage moves on Holly. Holding one hand to the left of her belly button (under or over pyjamas is fine) I take my right hand and run a circle clockwise around her belly button until my hands meet. Do this several times if they are enjoying it. I hope these tips help to make bedtimes with a toddler a little bit more mellow for you as they have done for me. Bioskin Junior is a new range of natural skincare products for babies and children by UK company, Salcura. The Bioskin Junior range is aimed specifically for children with eczema and severe dry skin which you know by now are occasionally troublesome for both Lara and her little sister Holly. The Salcura Bioskin Junior range contains at least 92% natural ingredients which means they are a far more natural alternative to steroids and emollient creams. The products are suitable for children and babies from three months upwards and both my 2 year old and 5 year old have been using them for the past few weeks. Lara and Holly quite enjoy their baths these days and they like to have a nice smelling bath but most bubble baths aren't appropriate as they irritate their skin. 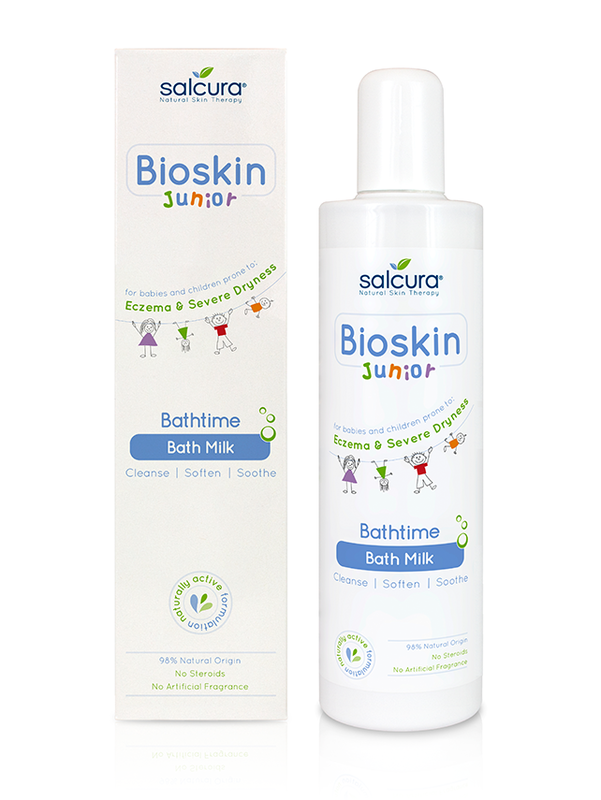 We tried out the Salcura Bioskin Junior Bath Milk which is designed to cleanse, soften and soothe the skin. It takes the edge off bath water (especially in our hard water area) but unlike some of the grown up bath milks I use, this one doesn't leave a slippery scum mark on the bath afterwards! I LOVE the scent of the Bioskin Junior bath milk, it is a light, summery scent of the active soothing ingredients Lavender and Chamomile. The bath milk is ideal for really really sore skin conditions because it helps to fight off infection from open sores and helps to soothe the pain. I can also smell the calendula in this bath milk which reminds me of the summery smell of my garden right now which is packed full of beautiful yellow calendula plants. The bath milk costs around £7.99 for a 300ml bottle. 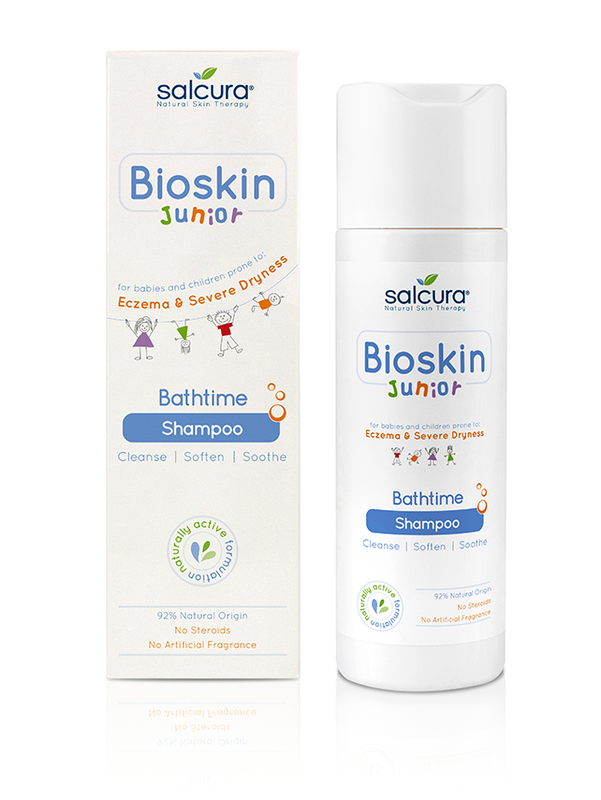 We have also tried the Salcura Bioskin Junior Conditioning Shampoo for babies and children. Shampoo is a big issue for us because most gentle baby shampoos aren't really very effective now that both girls have quite a head of hair to clean but most of the brightly coloured high-street brands of kids shampoos are packed full of chemicals which definitely contribute to the dry skin on Lara's back and arms. After a couple of weeks of use, I didn't feel that the Bioskin Junior shampoo was effective on my eldest daughter's hair (it left her hair very tangly) but I think it is great for my youngest daughter as has much shorter hair which doesn't need as much conditioning. The shampoo also smells of Chamomile and Lavender (but quite as strongly!) and it leaves Holly's hair smelling gorgeous. It very gently foams on the hair and is easy to rub in to the scalp. I think it would make a perfect baby shampoo as you can tell it is light and gentle as you use it. The soothing properties of the natural ingredients would help to soothe cradle cap or dry and itchy scalps in young children. The Conditioning Shampoo costs around £6.99 for 200ml. Salcura skincare products are available in pharmacies and online. The Bioskin Junior range also includes a gentle non-soap cleansing facial wash. You can follow Salcura on Facebook. With our very first 6-week school summer holiday starting today I'm keen to find lots of fun ideas for my 5 year old, Lara, busy and inspired over the long summer break. 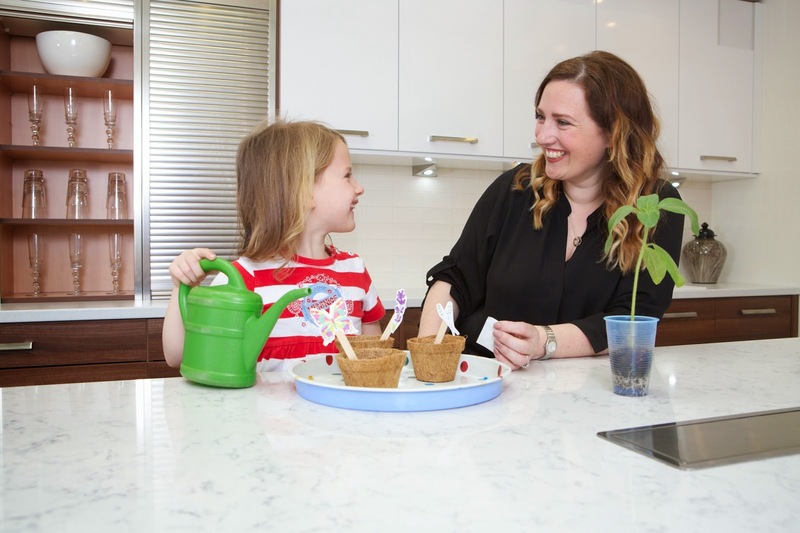 Kitchen retailer Betta Living has put together a Kids in the Kitchen guide with lots of different activities that can be done in your own kitchen for as little as 99p. We have been trying out a few of the activities and so we though we would share our top ten with you today (don't worry, the rest will come next week!). As you may know, my girls need little encouragement to get growing but we loved the idea of making a little kitchen garden to live on our window ledge. The girls decorated some little pots with craft materials and we planted a few new seeds - some lavender which should be lovely and fragrant next summer and some salad leaves. We have brought in a couple of our smaller tomato plants, chilli plants and young bean plants to live on the kitchen window too. The girls love the sense of responsibility and ownership of having plants of their own that they have to tend each day. Holly LOVES her Weetabix and she is also a fruit-monster so you should have seen the look on her face when her big sister made her a Weetabix face from fruit! The memory game brings back lots of brilliant memories for me. I'm sure my Mum used to play this at our birthday parties! Place lots of everyday items from the kitchen on a tray and let everyone take a look. Then cover with a tea-towel and remove an item. Remove the tea towel and see who is first to remember which item is missing. Lara is very practiced in the art of tea parties. On a sunny day you could host your tea party in the garden on a picnic mat. Not as easy as it sounds! The Paper Dolls by Julia Donaldson and Rebecca Cobb is a beautiful book that both of my girls love. 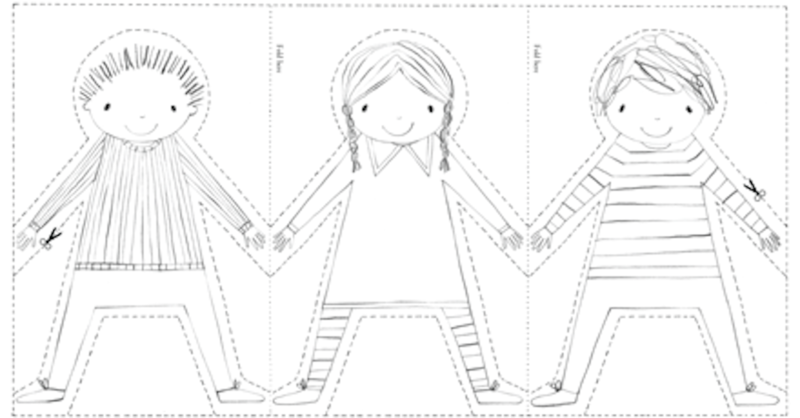 It inspired this activity of downloading a printable paper doll template to colour in and cut out. If dolls aren't your think then why not make paper robots instead? You can decorate your dolls with sparkly craft items to make this activity even more fun. Make your own exploding volcano in your own kitchen. Sprinkle some baking powder into the base of the container and slowly poured in the vinegar. Watch the chemical reaction unfold with wonder. Amazeballs! With a few bargain wooden spoons you can create a whole host of puppet characters. Add paint, wool, ribbon or fabric to really bring your characters to life. This is an activity that children of all ages enjoy. Raid the cupboards for pots and pans of different shapes and materials that will make a range of groovy noises. Supply your children with two wooden spoons each. Apply earplugs. Enjoy. At 5 years old, Lara's imagination is unstoppable. While her younger sister hasn't quite grasped the concept of putting on a show, Lara loved dressing up in all of her dressing up outfits to choose a character and put her drama-club skills to good use with a show for us. We used simple masks from starcutouts.com to allow the girls to create new characters for their show (the story was a little hard to understand but they had great fun. This time last year I didn't really understand the worries that some Mums have about keeping your little ones learning over the long summer holiday. Now, as Lara approaches the end of her foundation reception year at school, I'm certainly aware that there is a long 6 week holiday approaching and I'm interested to see how her reading, writing and maths skills fare over the summer without the additional support and inspiration that school provides. This month, the Netfix Stream Team were challenged to find some educational yet fun viewing options available to stream through Netflix that might help continue our children's learning over the summer holidays. Our summer holiday is likely to be spent doing a mixture of things - a couple of weeks of holiday club, a couple of exciting family weeks away exploring the UK and a few fun days out. But in among that I'm hoping to save a little money and do some creative and crafty activities at home so yes, we may chill out in front of the TV for a little while as well. Netflix inspired us with a fun activity that I think Lara will really take to - story starters. The idea of the game is that you roll a collection of dice that feature lots of different pictures. Whichever pictures are face up when the dice come to a standstill become the characters and theme for a story that you must tell, or write. This is a wonderful game for younger children as it doesn't require them to be able to read or write but it is just as suitable for older children too who would enjoy the challenge of a tricky combination of pictures. For us, story starters is a good way of encouraging Lara to do some writing during the holidays as she likes to have a good reason to write! Since we started our Netflix subscription, both Lara (5) and Holly (2) have seen a lot wider range of TV programmes. While I love CBeebies, I do sometimes find the programming a bit limited, especially at the times of day when we are home. I've really enjoyed introducing Holly to some of the pre-school programmes such as Dora the Explorer or Bubble Guppies because I can instantly see her learning new words and phrases. 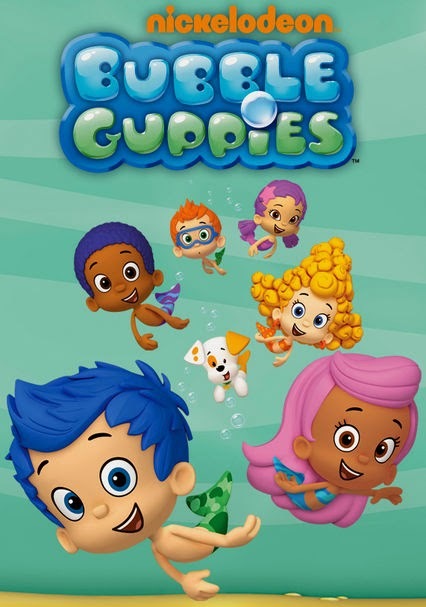 Bubble Guppies is a particularly interesting programme because Lara also learns a lot from each show which has a different theme - the human body, healthy eating, the farm, musical instruments, celebrations and so much more. Each episode features at least one catchy song on the theme, a few quizzes (that both girls now shout the answers to) and stretches of 'role play' which pass on the educational theme. When it gets to the end of the programme, I really feel that Lara has taken new knowledge away with her... a bit like I would do from a documentary. Dora the Explorer is another family favourite. We missed her when we didn't have satellite TV and it is great to have Dora back! 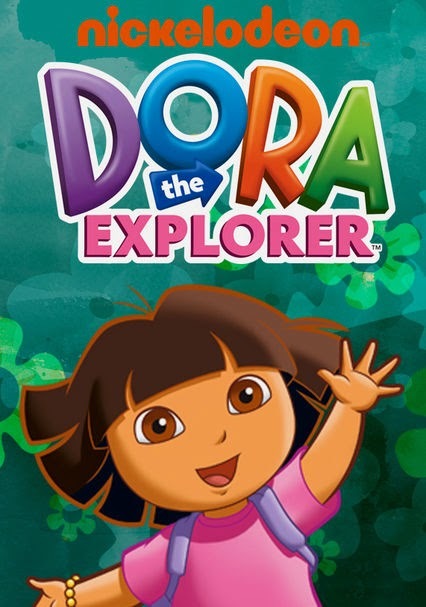 Dora is single-handedly responsible for Lara's interest in foreign languages because each episode features a handful of Spanish phrases including counting and colours. Dora's stories are very repetitive and I think this helps at a young age. Lara's favourite part of every Dora episode is "The map" so this week we decided to make our own maps in the style of Dora's map. This was a great creative activity that both girls could invest as much or as little time in as they liked. I think it would make a brilliant summer holiday activity, especially if you use the map afterwards for your own explorations. Take your home-made map out for a walk around your local streets to see if you can find your final destination. On your travels you can look out for birds and mini beasts as well as flowers and leaves of different colours and shapes. You'll be surprised how many different natural shapes can be found on your own doorstep. Barefoot SOS is a range of natural skincare products specifically designed for people with REALLY sensitive skin or conditions such as eczema and psoriasis. The Barefoot SOS range is available from MyPure and this month I have been trying out a couple of these gorgeous natural skincare products as part of the MyPure blogger programme. Barefoot is a brand I've known about for some time, one of the biggest names in natural skincare, but for some reason or other I've never tried them before. Although my skin is far less sensitive than it was a couple of years ago, I've got into the good habit of using natural facial skincare products so the Barefoot SOS range seemed perfect. The Barefoot SOS Soothing Face & Body Wash is a very light, non-foaming lotion which I use as a daily face wash to cleanse my skin in the minutes after I've woken up each morning. You can also use it as a gentle all-over body wash and in fact, it is suitable for even the most delicate of skin types so I could use it for the girls as a body wash as they both suffer from eczema. The Barefoot SOS face wash smells totally heavenly with a mix of zingy lemon tea tree oil and floral geranium scents which is one of the reasons why I enjoy using it in the mornings so much - it makes a good pick me up! Other active ingredients include evening primrose oil and jojoba oil for their moisturising properties and well as chickweed and burdock for their soothing, calming properties. The ingredients are 98% natural. Initially I was a little worried that the face wash would be too liquidy and because it is non-foaming I wasn't sure how effective it would be at cleaning away the night's gungy residue from my face each morning. But I needn't have worried - I think it is a pretty effective cleanser given that it is a natural product with as few irritants as possible. I think it makes a great facial wash, especially if you have sensitive skin of any sort. It costs £16 for 200ml. Next up is the Barefoot SOS Barrier Hand Cream. I LOVE this! They call this hand cream "Safety Gloves" because not only does it sooth dry skin on your hands, but it actively protects them against further damage, just like a pair of gloves! The hand cream is a really nice thick texture, and despite forming a "barrier" over your skin, it doesn't leave your hands feeling greasy, in fact, you can feel it getting to work straight away moisturising the backs of your hands. As with all products in the Barefoot SOS range, the barrier hand cream is suitable for really sensitive skin conditions. It is made with shea butter for helping to create that barrier against irritants and against drying agents but also with macadamia, sunflower and jojoba oils for extra moisturisation. When I first used the Barefoot SOS hand cream I couldn't quite put my finger on the scent. It isn't floral but then again it isn't really musky... to me it smelled of "plant"! In fact, the pure essential oils that give it the sent are frankincense and lavender which are both for soothing and restorative properties for both the skin and nails. The Barefoot SOS Barrier Hand Cream costs £13 for 50ml. You can follow MyPure on Facebook , Twitter , Google+ and Pinterest. Let's talk scooters. And scooter envy. During the school holidays, Lara attends a holiday club at our school for some of the time. She absolutely loves it (the novelty of school without school work, I hope, will never wear off) and every morning all of the children arrive on their scooters. This isn't something we cottoned on to until she had been to holiday club a few times and Lara started pestering to take her scooter. Once we had let her take her scooter she then pointed out that everyone else's scooter is faster?!? This summer Lara is absolutely bursting to go to holiday club with her new Zinc stunt scooter and I think that this time, it may be her friends that have scooter envy! The Zinc Zycho is a stunt scooter. Not necessarily the first type of scooter that comes to mind for a 5 year old girl but it suits Lara down to a T! This is the first time Lara has ever shown much interest in riding with just two wheels (she had a two-wheeled scooter but always seemed to gravitate back to her baby sister's 3-wheeler). The fluidity of movement and the lightness of the Zinc Zycho has given Lara a confidence I never expected. Lara is pulling stunts. Swirling, whirling and zig zagging. I rather suspect that before long she'll be asking me to take her to the skate park in Wokingham. The Zycho scooter is part of Zinc's phenomenal range of fashionable and groundbreaking scooters and is part of the their Team series of stunt scooters (Zinc do also make scooters specially for grown ups... and for preschoolers). The Zycho has a nice long deck (Mr. B can ride it too) which is made from really lightweight aluminium. The y-shaped handlebar is steel which keeps it straight and sturdy. Lara loved the Zinc branding (not sure she noticed the skull on the clamp) and the striking high-grip design on the deck. I think she is most pleased with the fact that, as a stunt scooter, she can spin the bar fully around (something I'm sure she has been dying to copy from some of the older children at holiday club). This scooter not only features alloy wheels(!) and a really flexible deck (they say its the Zinc elements that do it) but a hard-wearing break which is an essential on a stunt scooter (or at least it will be once Lara has learned some proper moves). Honestly, I'm quite excited about seeing Lara grow into her "real" scooter and start learning some scooter moves, probably more so than I am about seeing her learn to ride a bike without stabilizers (which seems like it might be a long way off!). Right now, I'm just enjoying watching the MASSIVE smile on Lara's face when she is riding her scooter and I hope she has great fun on it in the playground at holiday club this summer. You may already know that Elmer the patchwork elephant is celebration 25 years in print this year (if not, where have you been? go read my original Elmer post with lots of fun celebration ideas). Up and down the country there are Elmer elephant parades taking place - find out at your local library whether there are any activities near you. Here at Mellow HQ we have had our own little celebration of Elmer's birthday, inspired by this downloadable activity pack. This weekend Lara and Holly made some Elmer bunting to decorate the house. The girls each made an Elmer mask out of tissue paper and plastic plates and a trunk made out of kitchen rolls. And this awesome Elmer which Holly made out of a plastic milk bottle! If you are looking for other fun Elmer gifts and activities then check out this wonderful giant floor puzzle which has one colourful design on the front, and a black and white design on the back for you to colour in yourself. Holly LOVES this jigsaw puzzle. Also on sale this summer is a fun Elmer snow globe into which you can place a photo of your little one. It is really easy to change the photo inside so you can change it whenever you fancy and see Elmer celebrating with your little one! 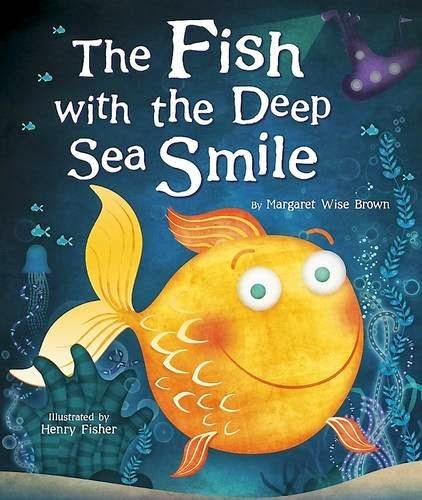 The Fish with the Deep Sea Smile is written by Margaret Wise Brown, illustrated by Henry Fisher and published by Parragon Books. Margaret Wise Brown was an american writer in the early early to mid 1900s who wrote a large number of children's poems and short stories. The Fish with the Deep Sea Smile is one of her poems that has been given a new lease of life in this bright and colourful illustrated book. The poem certainly reads like a traditional poem and has that rhythmic sound to it which reminds me just a touch of some Edward Lear poetry and I think that having a book dedicated to it with such fun pictures is a great way of introducing a classic poetry style to children. The poem features a family who go fishing, looking for the fish with the deep sea smile. I'm not quite sure what their end goal was but yes, the do eventually find said fish after quite a lot of searching. The fish smiles... then jumps back in again. Good on the fish, I say! Each page is packed full of brightly coloured smiling fish of all shapes and sizes. There are bubbles and waves and lots of different shades of beautiful deep blue of the ocean. The bright rays of the sun are also a common theme throughout the book. The illustrations certainly 'make' this story which could be quite dry otherwise. For me, I found the rhyme a little bit predictable (mile and smile feature quite a lot, the whole way through) and I also found that the verses had been split over pages in some cases so the first couple of times I read The Fish with the Deep Sea Smile to my girls, I stuttered a bit with the rhyme. After a couple of reads though, I really got into the rhyme and enjoyed reading poetry to my girls - it made me want to do it more often! You can follow Parragon Books on twitter and as @parragonbooks on instagram and pinterest. Every morning and every evening we struggle with toothbrushing. Holly is now at the age where she believes she can do everything on her own, and when she wants to (not when we want her to). Toothbrushing simply doesn't fit in with her plans. It's not unusual. In fact, looking back through my blog archives I can see that at this age, Lara was just as awkward and argumentative at toothbrushing time as her younger sister is now. So I guess the fact that Lara now brushes her teeth beautifully offers some light at the end of the tunnel. But it still doesn't stop it being a struggle now. I have resorted to threatening (or perhaps even bribing) Holly with her first real visit to the Dentist. Practitioners and dentists in London, as in every other city in the UK, will emphasise the fact that as soon as your baby's milk teeth come through, you should start brushing our children’s teeth so as to avoid the costs of dental prices as they grow older. There are many websites such as the NHS and Toothpick, that guide you on how to best approach toothbushing for a baby or toddler but nothing really prepares you for the point when they actively start refusing to brush. Most children are scared of visiting the dentist because of the stories they hear from friends and TV programmes about having to have teeth removed. But for my girls, a trip to the dentist seems to be something they really look forward to - a special day out! I'm currently using this to my advantage. Holly actively wants to go to the dentist (having only ever been as an onlooker in the past) and in order to encourage her to let us brush her teeth I tell her about the things that the dentist will ask her to do when she gets there. "Say aaaah". Many dentists will let you take your baby or toddler along with you to your own dentist appointment and will happily give them a very quick check. Neither of the dentists we have attended would take the girls for their own appointment until they are 3 years old, even if they have a mouth full of teeth. This seems a bit of a shame because not only does a regular visit to the dentist de-mystify some of the scary unknowns about the dentist but it is also an early opportunity for the dentist to spot any possible problems from a very early age. Holly first came with me to the dentists when she was about a week old and has been several times since - it is something a bit different and fun for her and I hope this will make it easier and less stressful for her in the future. So, each evening I now tell Holly and Lara that I want them to brush their teeth until they sparkle or else the dentist won't be very happy when we go to visit. This tactic works to an extent but Holly is still very good at finding excuses for why she doesn't need to brush. At this age (in fact right up to about 7 years old) dentists recommend that you help your child to brush their teeth because without your help they are unlikely to reach all the right places or use the correct brushing motion. Holly fights this so much that it takes both myself and Mr. B. to hold her while we brush. It is such hard work but I'm sure it is worth it. Brushing at least twice a day with a gentle toothpaste should eventually become a habit for both of them and it is a good investment in their dental health. Gone are the days when I could afford either the time or the money to spend my saturday afternoons being pampered at the salon. These days a pedicure is a very rare experience for me and I try to do my best at home. This natty little gadget is now part of my pedicure routine - the Elle Macpherson Heel Smoother from Homedics. Now that the summer is in full swing, I do like to wear sandals and flip flops - even to work so my feet need a bit more maintenance. This Elle Macpherson Heel Smoother is a little electronic tool which you can use to remove dry skin and buff away dry patches and generally give your feet a bit of a polish. It comes with two attachments, one to scrub the skin and one to buff it. The heel smoother is battery powered and when you switch it on the head rotates at speed. There is no doubt that the Elle Macpherson heel smoother takes some of the effort out of buffing the dry skin from your feet. It is also a bit tidier because the first stage of skin removal manages to capture some of the yucky bits inside its little void - you need to empty it after use. I found the buffer head to be just as effective as if I had used a manual buffing tool - it comes with a few replacement pads for when they wear down. I found the scrubbing head a little disappointing though, especially in comparison to the hand-held dry skin remover that my husband uses. I was expecting the electronic rotating head to make a really big impact... but it didn't. The Elle Macpherson heel smoother is a smart little gadget and, when it is housed in its lid and standing upright on my dressing table it fits just right in. The new Elle Macpherson heel smoother by Homedics costs £19.99 and is available from Argos. People who have read Mellow Mummy over the years will know that both Holly and (especially) Lara suffer from dry skin on their arms and legs. I have got their eczema under control over the years by switching to only non-bio detergents and by trying to use natural and organic shampoos, bubble baths and shower gels. Ordinarily, I tend to steer clear of high street brands when I'm looking for a moisturiser for the girls but Oilatum sent me a sample of their Oilatum Daily Junior Lotion to try out on the girls because they wanted to show me how gentle it was on children and babies. Oilatum Daily Junior Lotion is quite thick. Holly loves the texture and will actively seek it out in the evenings to apply to herself. Lara isn't so keen on the feeling of it, she is very much like her Daddy and only likes using body moisturisers which absorb really quickly - this one does take quite some time and you can feel it on their skin afterwards. That feeling afterwards is a thin layer of mineral oil which is designed to act as a barrier to prevent further drying of the skin. I have a mild allergic reaction to some mineral oils but I tried the Oilatum Daily Junior Lotion on my own skin and had no problem at all - in fact, I've found it to be one of the best body lotions I've tried in a very long time and I REALLY like the feeling of the skin on my arms when I wake up in the morning after using it. Shhhhh... don't tell Holly! The lotion has a gentle scent that reminds me a little of baby talcs. I would say that it is a perfect product for Holly who has had occasional dry skin since being a baby and, on a hot day she certainly finds it a soothing end to the day and part of her daily bedtime ritual. But for Lara, Oilatum Daily Junior Lotion isn't the right product but thankfully, these days, we don't have many ezcema or dry skin issues we have to tackle any more.